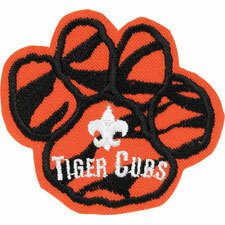 Here is a great emblem for your Tiger to begin his patch collection. Available at your scout Shop or www.scoutstuff.org . Narrator: When a boy becomes a Tiger Cub, he is just beginning a trail that will lead him through Cub Scouting and into Boy Scouting. This Tiger Cub Totem (hold up) is a symbol of the first part of that trail, the Tiger Cub trail, one that you will walk with your adult partner during the coming year as you search, discover, and share the world around you. Tonight I would like to present to each of you this totem to wear on your uniform. It is to remind you of all the fun you will have while working on the Tiger Badge this year with your partner. As you progress through Tiger Cubs and finish each achievement requirement, you will be presented a bead to hang from your Tiger Totem. There are White beads for Family Activities, Orange beads for den activities, and Black beads for Go See It activities. The Tiger Totem has a special meaning for you. Listen carefully as we explain it. 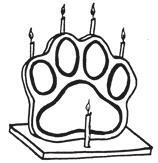 Tiger Leader: The palm in the Totem represents the spirit of scouting (light the front candle). The spirit of scouting is one of helping and friendship. Each toe has a special meaning for you, too. Listen close. Cubmaster: The first toe is (light first candle) to remind you to of your duty to God. Your parents and religious leaders teach you to know and serve God. By following these teachings, you show your love to God. Asst CM: The second toe is (light second candle) to remind you to love your family. A Tiger Cub should always be kind and helpful to his family. By helping your home to be a happy place, you show your love to your family. Asst. TL: The third toe is (light third candle) to remind you to love our country. This means being a good American. You help your community in any way you can. By being a good citizen, you show your love to your country. Cubmaster: The fourth toe is (light fourth candle) to remind you to always Do Your Best, as you search, discover and share in our world. The world we live in is a big and beautiful place. There are many things to learn. As a Tiger cub, you will learn a lot about your world. Now, each time you see a Tiger Totem, it will help you to remember how to be a good Tiger Cub. Would all Tiger Cubs and their partners please stand and repeat the Cub Scout motto. Congratulations on completing your first step as Cub Scouts. Welcome!! We are excited to have you in our pack. I welcome all of you to the adventure of Tiger Cubs! Cubmaster may now lead the pack in a Tiger "spelldown". Together with your adult partner, look at a map of your community. The map can be one your adult partner has, or a map that your adult partner draws with you. On that map locate your home, and find three places you like to go. Places to find on the map could be your school, your place of worship, the place where you have your pack meetings, a store, a park or playground, or the house of a friend or a relative. This Achievement fits with the Citizenship Character Connection. When we say the Pledge of Allegiance we show that we are proud to live in our country. One of the easiest ways to get to know your community is to go out and "do the town." Understand that each community is different and you may not be able to do in one community that you could do in another. The following is a list of suggested places besides the Police Station or Fire Station listed in the Achievement within many communities that the Tiger group could visit when working on this Achievement. Visit Town Hall. Learn what services are available for others within your community. Visit a bakery, a restaurant or store. Have a scavenger hunt. Plan the list of items that can be found locally. Plan a �emake believe' stay at home vacation. What other things can be done or visited in your area. Visit a nursing or retirement home. Take a tray of favors for the children's ward of a hospital. Visit community organizations that give aid to the needy. Visit a recycling center. Take aluminum cans and or plastic containers. Visit fire station, hospital or police station. Visit museums, zoos or historical sites. Adopt a stream. park or roadside to clean up and keep beautiful. Bring lunch to school in a lunch box. Save your paper bags. Care for toys so they will last longer. Then you won't have to replace them and can pass them on. Donate clothes that you have outgrown to a needy person or someone smaller. Encourage others to join you in collecting glass, newspaper and aluminum to be recycled. Getin the habit of turning off the water when you brush your teeth. Turn it on only to wet your brush and to rinse. Help by caring about our wildlife & be very careful with matches. Insiston buying products that are biodegradable (they rot or decompose when discarded.) Most plastics are not. Jog or walk, ride a bike or scooter from place to place to save energy. Keep jars of cold water in the refrig-erator so you won't have to run the tap water waiting for it to get cold. Look for the recycled symbol on products you buy. Make it a habit to cut each six-pack ring. These sometimes wind up in the oceans. Animals often get caught in them. Never litter. Always put your trash in a trash can. Open the blinds in the wintertime to let in the sun. Close blinds in the summer to keep out the sun's heat. Plant a tree to stop soil erosion, give you shade and give birds a home. Quitbuying products that have a lot of packaging. Reduce the amount of water you use to keep clean. Take showers, not baths. Save energy by asking your parents to turn down the thermostat. Turn off lights if you are the last person to leave a room. Turn off appliances if you are not using them. Use products made to be used many times, such as sponges or cloth towels. Value and appreciate your Earth. Realize that you can make a difference. Watchwhat you pour in the drain. Hazardous waste can get into the ground water. eXamine labels before using products Certain household cleaners can be dangerous. Yearn to do what you can to help our environment. Grow up to be an adult who takes an interest, too. Zip to close doors and windows if they are opened when the heater or air conditioner is on. Smell Walk: Sniff your way around the block. Write down the odors you recognize, and draw a picture of what causes those smells. Label how you feel about each smell. Color Walk: Choose a color like red and walk only toward red object for as long as you can. Can you make it all the way around your block? Write a history of your color walk. You might try drawing a map of it. Sound Walk: Listen your way around the block. Write down the sounds you recognize. Draw a picture of the things, which cause these sounds. Label how you feel about each sound. Opening: For Tigers this is short and sweet. Remember the new slogan you are learning in Scouts---KISMIF (Keep it simple, make it fun). Ask a Tiger and his partner to lead the group in the Pledge of Allegiance to the United States Flag. As group leader, explain the theme for this meeting and how you hope everyone will learn a little more about your community. Share any information coming from the Pack, i.e. When is Pack meeting, what do the Tigers need to do to prepare, when the next meeting will be and who is running it. Should there be expenses for the group, now is the time that money should be collected. Activity: Using the map, that now has the group's homes located, start locating various other parts that make up a community. Go around the room and have each scout name another aspect of the community. Some of these may include: Fire Station, Police Station, Town Hall, Library, favorite restaurants, video store, personal place of worship, hospital or physician's office, and more and more and more. Take a minute with each suggestion and see if your group can tell you how this place helps the community. Believe me the video store will have a totally different answer than the police station. Now it is time to get away from the table. Ask the boys to do an impromptu skit where they meet one by one on the street and each is going somewhere different. See how many places within the community they wish to go. This is the adult partner's time to see the hidden hams within their boys.